Tue, Jul 13, 2010. 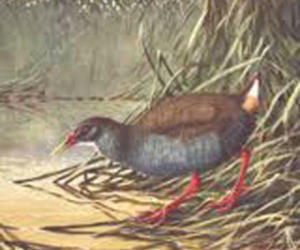 Zapata Rail Cyanolimnas cerverai is a very poorly-known waterbird endemic to Cuba, and today a relict species from the Zapata Swamp in western Cuba. The bird's elusive nature has caused confusion within the ornithological community as to its status' confusion that may have unwittingly provided a smoke screen to a very real threat that may be driving the species to extinction. Zapata Rail was discovered near Santo Tomás in 1927 by Fermin Cervera (a Spanish entomologist and bird collector). James Bond (Caribbean ornithologist extraordinaire) had no difficulty finding the bird at this same locality in 1931. However, the species was not then seen for several decades. In fact, the bird has probably been seen less than 15 times since the 1930s, with all of these records coming from just two or three localities. In the 1970s the voice of the rail was recorded and published (by George Reynard and Orlando Garrido). This seemed to unlock the mystery's birds sounding the same as the recording, or indeed responding to playback of the voice were heard at a number of new localities. Many new records, often of multiple individuals, were documented in the 1970s and during the 1990s as a new wave of research focused on the Caribbean's largest wetland. However, in 2001, Arturo Kirkconnell (co-author with Garrido of the 2000 Field guide to the birds of Cuba book) discovered that the recording people had been using for 25 years was in fact of the widespread Spotted Rail Pardirallus maculatus. From that point, none of the previous records of "heard but not seen" birds could be counted within our knowledge-base for the species. The vocalisation of Zapata Rail is still a mystery although at the time of its discovery it was described as a loud "kwowk", like a Limpkin. 2001 was a bad year for Zapata Rail. In November that year, hurricane "Michelle" hit the region and damaged a facility that was breeding African Catfish Clarias gariepinus. As a result of the hurricane this alien invasive fish reached the Zapata Swamp region where it has since been thriving and severely impacting the fragile underwater flora and fauna. Young Moorhen Gallinula chloropus and Purple Gallinules Porphyrio martinica have been found in the stomach contents of catfish from the swamp, so we know that the catfish are depleting local populations of rallidae species. Worryingly, Arturo's work in Zapata that has involved over 100 trips in the last 20 years, suggests that areas where he was recording large numbers of rails (Spotted Rail Pardirallus maculates, King Rail Rallus elegans and Sora Porzana carolina) during the 1990s now hold few, if any birds. Due to its extremely small known range and an apparent catastrophic decline in related species due to the recent arrival of the invasive predatory catfish, Zapata Rail was uplisted by BirdLife to Critically Endangered on the IUCN Red List. Being potentially close to extinction, there is an urgent need for a reliable assessment of the species' range and population on which to base conservation actions. BirdLife, working in collaboration with Centro Nacional de Areas Protegidas (CNAP, BirdLife in Cuba) and Cuba's Museo Nacional de Historia Natural, is actively seeking funding to support such an assessment. If you would like to contribute to our efforts to save this Critically Endangered bird,please click on the "Donate" button below.